Browsing for posts in the Wine category. Last weekend we had beautiful weather (in March in PDX, no less!) and so took advantage by driving out to a few of the many fantastic vineyards within an hour of our abode. 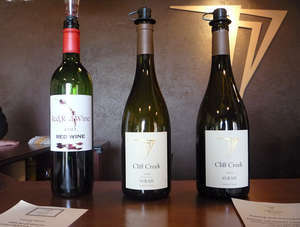 As always, included in our visits was a favorite: Cliff Creek Vineyards tasting room in Carlton, OR. Just over a year ago Cliff Creek wowed us with their Claret, (pronounced “clarette” not “claray”), which continues to be one of our favorite wines. In fact, it wasn’t on their flight list this time and we had to request a special taste, after which we of course bought a supply for home. It was surprisingly less expensive than we remembered at $22.50/bottle (club price). And well worth it! A pleasant surprise during our trip to the Willamette Valley was Troon’s tasting room in Carlton, Oregon. The highlight of the wines we tasted was the “Kubli Bench Cabernet Sauvingnon” (2006). This wine was superb, light yet full bodied, all in all a very well-rounded cab. Yes, we know, that’s not very descriptive–you’ll just have to trust us, it was awesome! We definitely brought some home. In general, while last year their “high-end” wines seemed overpriced and didn’t quite deliver, this year they were excellent and you could tell they had put lots of care into developing them. 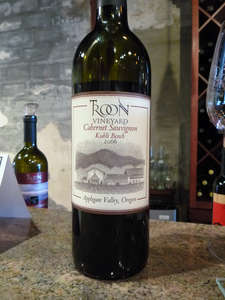 We picked up this gem a few months ago in the Troon Vineyards tasting room in Carlton. 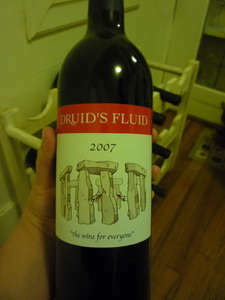 Although the majority of their wines were fairly standard in my opinion, Druid’s Fluid really stood out. It’s a wonderfully full-bodied red table wine. A lot of Troon’s wines were on the pricier side ($30-$50 a bottle) but Druid’s Fluid was under $20. 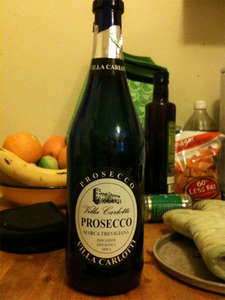 Each time we open a bottle, we are glad that we brought some home.